Comparison: Don't you want to read as well as your brothers? None of these ideas resonated with me. Each had its own drawbacks. 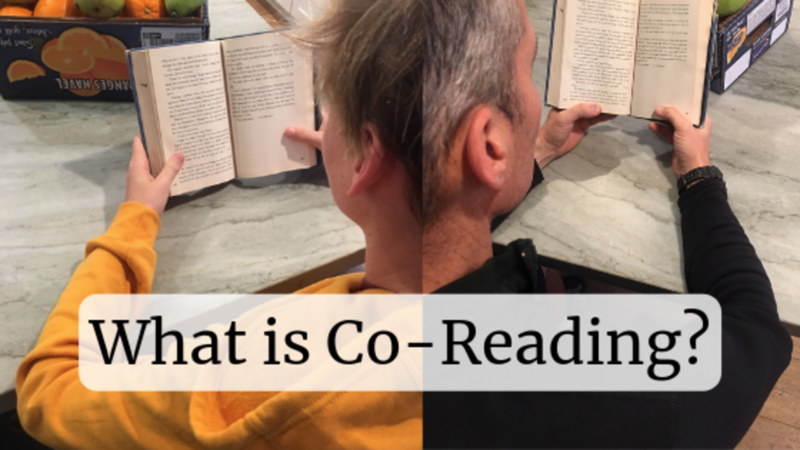 After months of thinking, I came up with another option that I call "co-reading". Co-reading is when you and your child both read the same book at the same time (not literally at the same time). For instance, each of you read one chapter per day of the same book. Then, that night, you both discuss the plot, characters, literary techniques, action scenes, etc. So far, this technique has shown promise. We each read one chapter per night (about 10-12 pages) and then have a nightly discussion about it. We both feel some obligation to each other to have the chapter read by the time we connect. It's almost like a mini book club. You want to be a contributor. I have no idea how long this experiment will last or if it will bear fruit. So far, we're only on our third book. But, that's better than no books. Obviously, the training wheels will have to come off eventually. This isn't a long-term solution. This technique will likely end when your child enters high school. The idea is to create a habit of reading that will eventually become self-directed. Sometimes, kids just need a few months of focused reading before they get comfortable with the practice. I give myself five more months of co-reading with my son. If, he hasn't caught the reading bug by the beginning of 9th grade - it will be over. He'll be on his own. Yes, this is a labor-intensive strategy for a parent. I don't necessarily need (or want) this on my daily to-do list. However, I believe that giving our children the gift of reading is worth the effort. Have you come up with any other strategies to help build a habit of reading into your child?